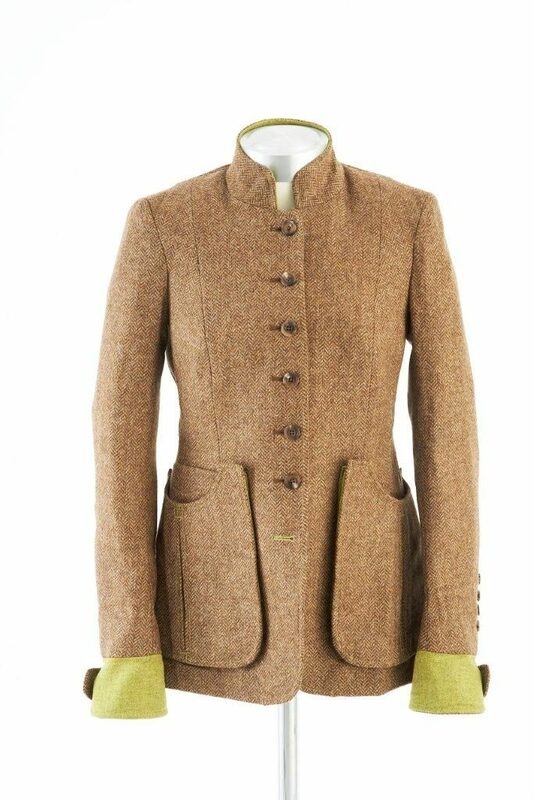 The Norfolk Jacket may well have taken its name from the English county, but other sources suggest it was originally a hunting coat invented by the 15th Duke of Norfolk. More likely is that the forerunner was a uniquely pleated jacket developed by Coke of Norfolk, the Earl of Leicester, for duck shooting parties on the Holkham estate in North Norfolk. Traditionally the style was belted to snugly fit layers of underclothing along the windswept north Norfolk coast. 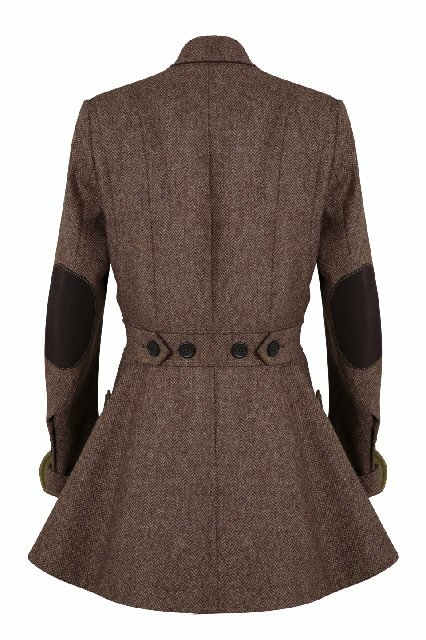 Our luxury Ladies Norfolk Jacket, is tailored specifically for women, with a flattering but functional fit and flare silhouette. 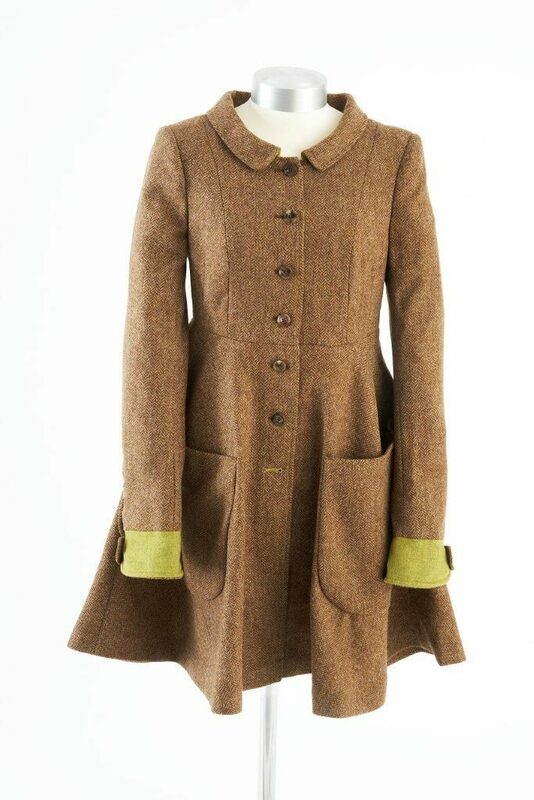 The country colours, here in brown but also available in green reflect nature, with racy colour pops in chartreuse. 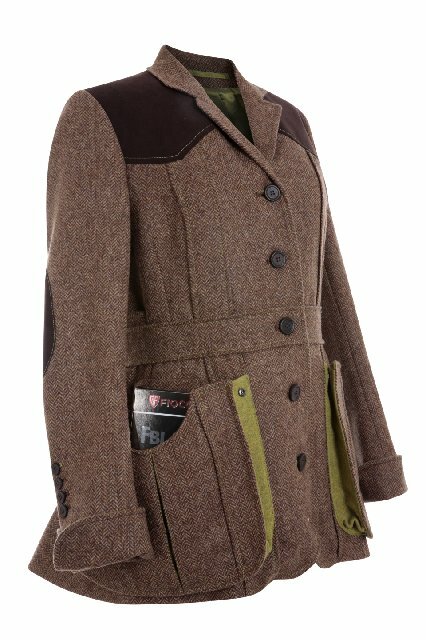 Equipped with capacious patch pockets to carry anything from smart phones and iPads to hunting and shooting gear, and back action pleats for movement, the Ladies Norfolk Jacket is ergonomically functional and provides ultimate comfort, without compromising on elegance and style. The garment is functional and comfortable for shooting, outdoor pursuits or fashionable wear. 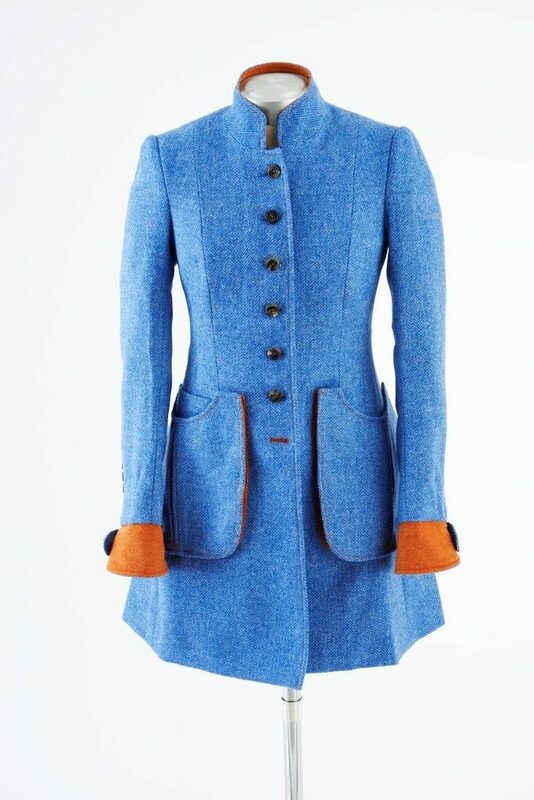 The jacket has Alcantara suede mitred shoulders, elbow patches and under collar. 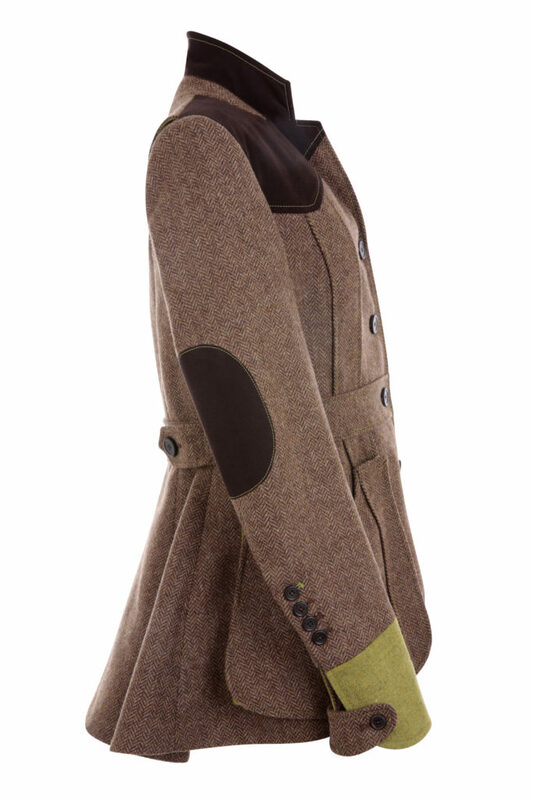 For warmth there is an extended sleeve with turnback cuffs and kidney flaps on cuffs with functional buttons. There is an additional ticket pocket inside right bellows pocket and funky stretch elastic tape inside left pocket, designed for bullets – or perfect for lipsticks etc. Finally there is a waistband with ledge stitched seams and waist adjusters at back with 2 sets of buttons – for slim or comfort fitting. 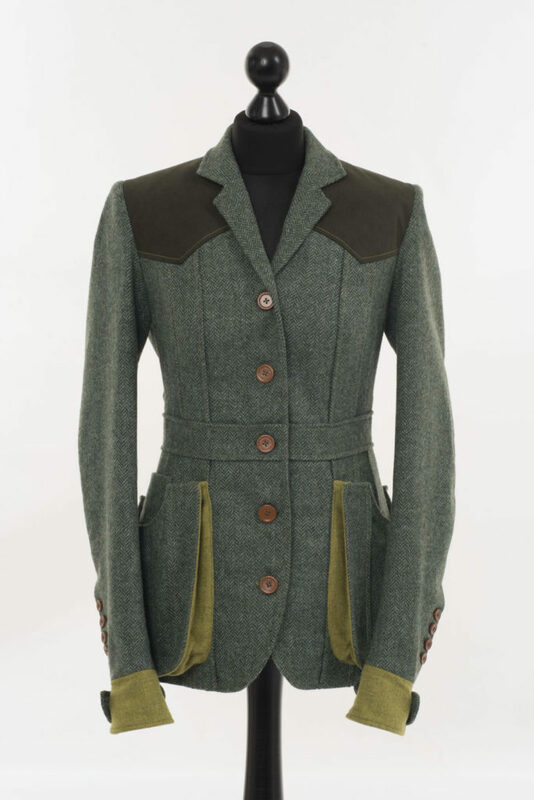 Vintage inspired Norfolk jacket with notched lapels. Action back insets with contrast fabric colour inside. Norfolk panels with ledge stitch seams. Satin accent colour pipe in-between facing and lining in accent colour. Shooting bellows pockets with contrast fabric in bellows and pocket pleat. 5 leather buttons centre front and 4 at cuffs. Signature contrast colour buttonholes on bottom button and top cuff. Internal Recoil pockets on right and left with envelope catch for recoil pad. Recoil pad shock absorber pad – can work in either side. Top stitching throughout in accent colour chartreuse.